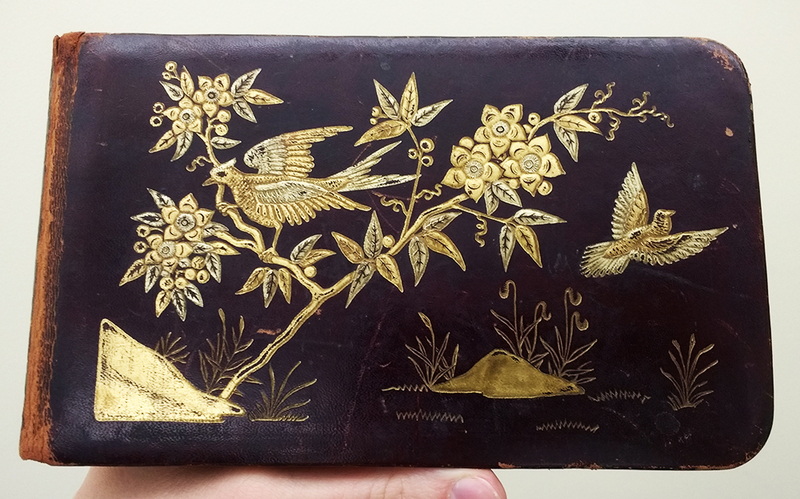 Flipping through it, I saw that it included a lot of signatures from 1879 through about 1883, some poems, and some really beautiful hand-drawn art. Some people chose to leave simple notes, like the one above. 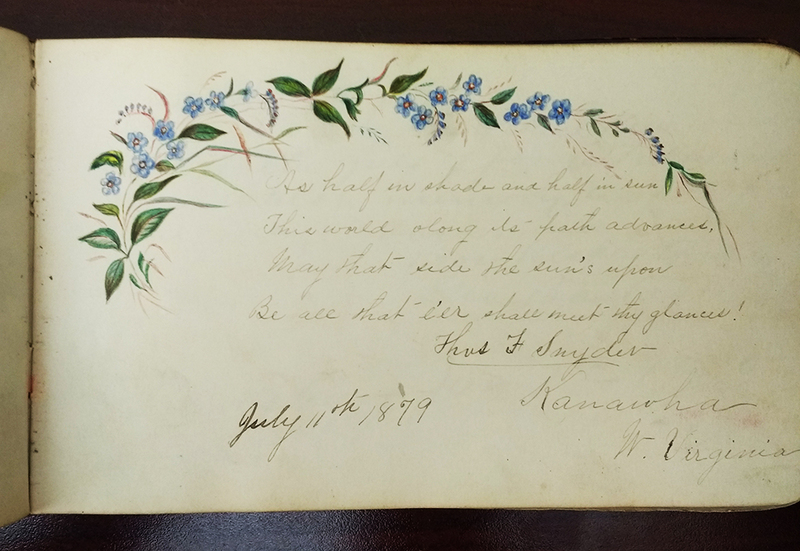 Some people mixed their art with poetry–these flowers might be forget-me-nots, very appropriate for an autograph book. 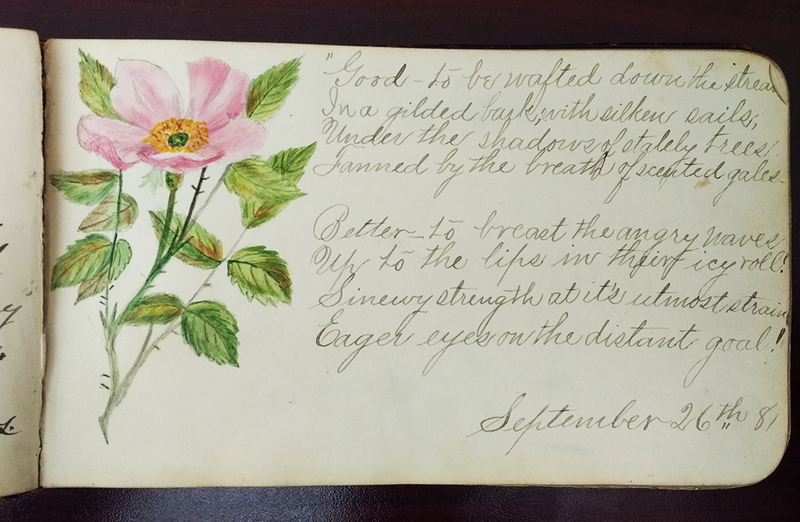 I wondered who owned this autograph book, but I didn’t have to look far, as whoever gifted it to the owner wrote the owner’s name on the first page: Gertie L. Hayes. 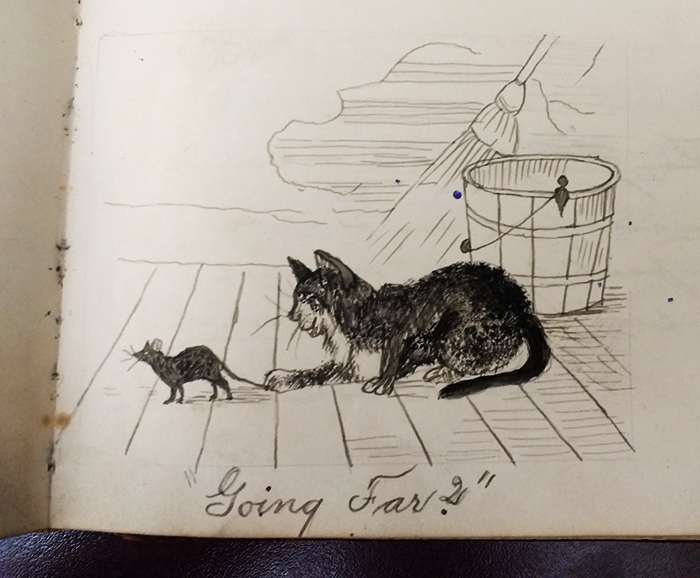 The second page includes a helpful note: “When by chance you see this page,/ May you remember when your age/ Reached Seventeen” dated February 26, 1879. That puts her birthday on February 26, 1862. Some people left art with no note! 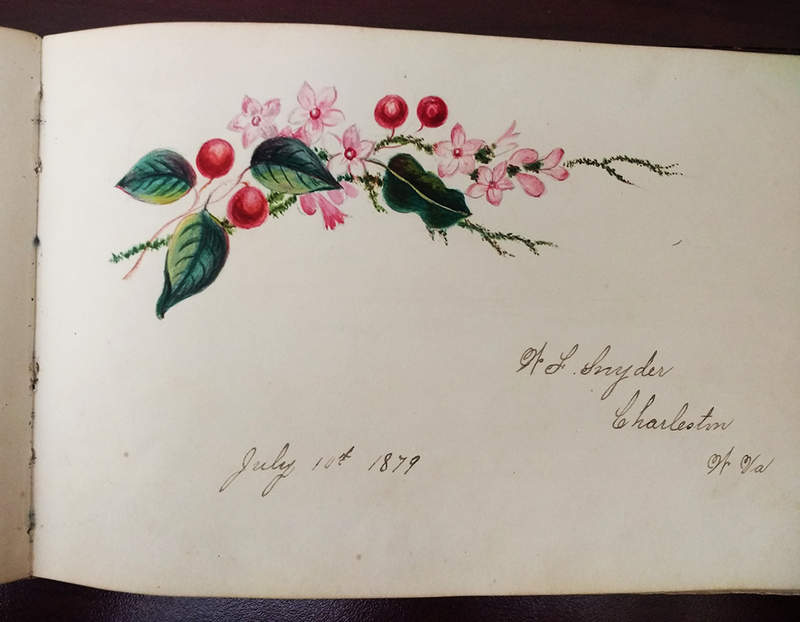 Searching the state’s West Virginia Vital Records database for a Hayes girl born in 1862 returns one result, and Eliza Hayes from Monongalia County, born to parents Henry S. Hayes (listed as a farmer) and Ann Hayes, of Morgantown. Since Eliza and Gertie L. seem like they ought to be two different people, I needed more evidence. I’m not sure if these are cherry blossoms or something else, but they are gorgeous! The 1880 census shows an L. Gertie Hayes living with her parents and siblings in Morgantown. 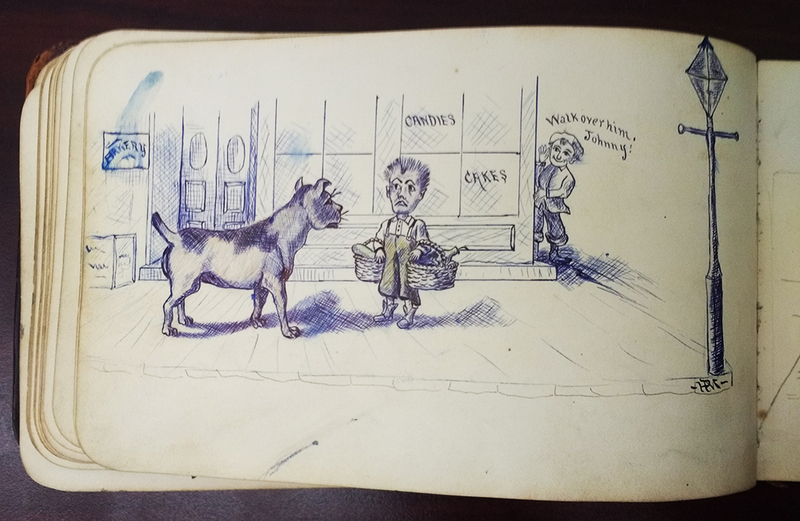 Myrtie Hayes, who signed the autograph book, is also present in the 1880 census, and their father, Henry, was by then listed as a retail grocer. 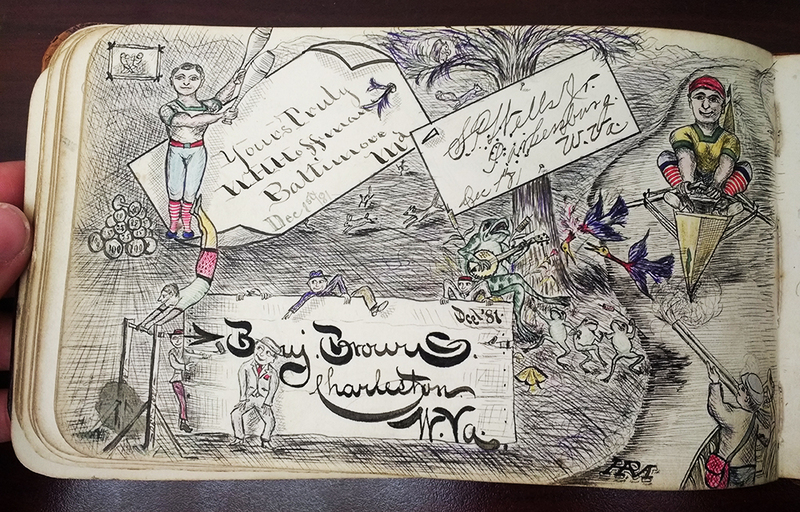 Through various records, we find that her mother’s maiden name was Finnell, and two of Gertie’s Finnell cousins left signatures in the autograph book. 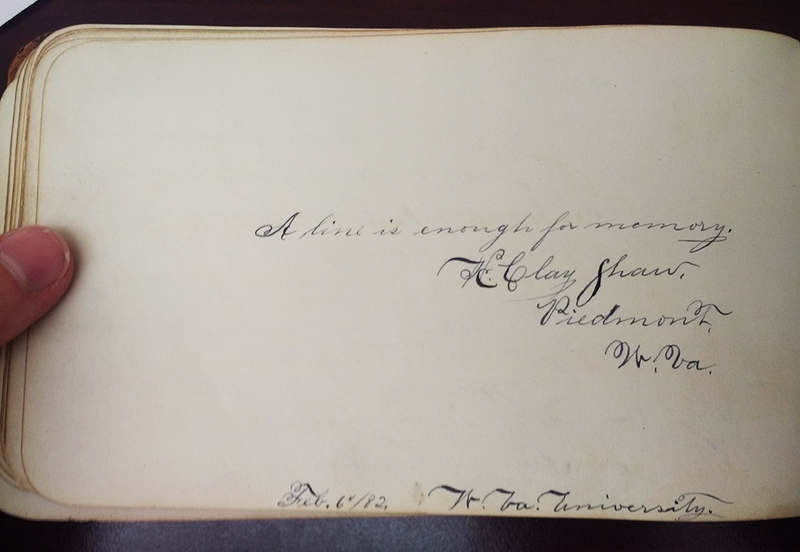 In addition to a few cousins and two of her sisters, she had many friends sign the book, friends from across the West Virginia, Virginia, and Maryland area. Some of her friends were very good artists. I love the level of detail and amount of activity going on in the above image, especially the banjo-strumming frog. I don’t think Johnny’s friend is providing good advice about how to interact with strange dogs in this drawing. Looking through a few more census records, we see that Gertie worked as a bank clerk. In the 1910 and 1920 censuses, she lived with family on 147 Fayette Street. 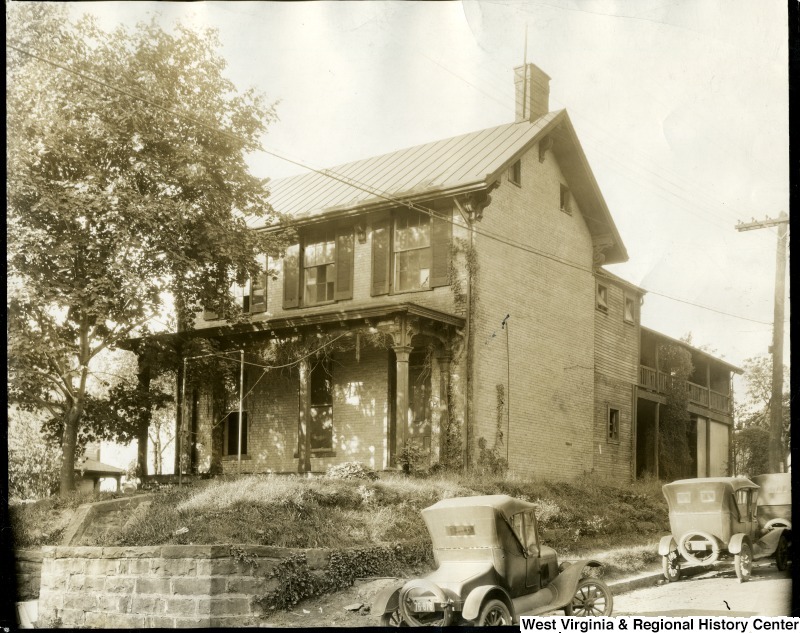 I checked the Sanborn fire insurance map for Morgantown in 1927, and by then her home was no longer standing at the corner of Fayette and Chestnut, but there is a picture of that house in WV History OnView. I wonder if this undated photo was taken shortly before the house was demolished in the 1920s, since there are a few panes of glass missing. If anyone can date the cars, please let us know! Since she was listed in the birth register as Eliza Hayes, I think that her name may have become Lizzie Gertrude, L. Gertrude, and/or Gertrude L. over time. The grave marker for L. Gertrude Hayes lies in Oak Grove Cemetery, along with many members of her family. She died on March 5, 1957, of pneumonia, at age 95. That last flower is a rose. It’s just open. Jane, I was as taken with the book as you were. Yes, the flower is a rose. A wild rose, what roses used to look like before hybridization. There is the name John Samsel in the book. Probably a relative of the man by the same name that writes the history column in the Dom Post.